Introducing the QualityCare™ website, a freely available resource that provides direct answers to important questions about cancer associated thrombosis (CAT). 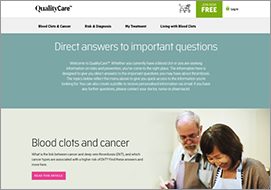 Recently launched by LEO Pharma, QualityCare™ takes a person-centred care approach which looks to provide patients and their carers with a variety of resources that discuss the link between blood clots and cancer, the risk and diagnosis of blood clots and post-treatment management. This communication was supported by LEO Pharma. LEO Pharma has no editorial control of Thrombus. QualityCare™ is a clear and well illustrated website, developed by LEO Pharma, elucidating the many aspects of cancer-associated thrombosis. Communication about cancer and thrombosis is the golden key: QualityCare™ does this wonderfully well. It cuts straight to the chase – striving to increase awareness of the link between cancer and clots, to highlight the warning signs of both DVT and PE and to discuss the prevention of a clot. The website conveys person-centred care, and the highlight for me is the video, ‘Blood Clots, Cancer and You’, which is well executed and very accessible. QualityCare™ has the potential to make a huge difference to patients’ understanding of the various clinical aspects of thrombosis and to their care.